When a group of rebels convicted as terrorists escape execution by fleeing from the year 2077 to 2012, Kiera Cameron (Rachel Nichols), a future Vancouver law enforcement officer (called Protector), is involuntarily transported with them. In order to track the terrorists down and keep them from changing the past (and presumably future), Kiera joins the 2012 Vancouver Police Department and uses the skills of a young tech expert, Alec Sadler (Erik Knudsen), to both track the Liber8 agents' pasts and provide her with the necessary information and contacts to operate in the present despite her lack of official credentials. The future of 2077 is a dystopian one in which world governments have collapsed and corporations now dominate the planet, instituting a high-surveillance, technically advanced police state and removing certain social freedoms, specifically criticism against the "Corporate Congress". The society seems relatively free, with a working class that enjoys a high standard of living in contrast with scenes of severe prosecution upon a downtrodden people who cannot afford food. The moral dilemma this presents is that the group of eight from 2077 (who call themselves "Liber8"), while self-admittedly having killed tens of thousands of people as collateral, consider themselves to be freedom fighters against the Orwellian corporate regime that dominates their time; Kiera's actions are primarily focused on preserving her timeline so that she can return to her family rather than considering the broader implications of her society. 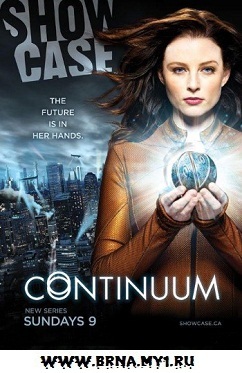 She has already released a woman who committed a murder in the present because she would go on to use stolen technology to develop an efficient new power supply for the world of the future, but is otherwise willing to treat the crimes she investigates on their merits in the present rather than constantly worrying how they will affect her future. After Kiera goes back in time, she finds that she can communicate with a young Alec Sadler using his prototype 2012 wireless technology, which will become pervasive in 2077 and incorporated in her cybernetic police gear. She learns that in sixty years' time, an elderly Alec Sadler is actually the head of the mega-corporation Sadtech, whose technology may (inadvertently or otherwise) have been used to send Kiera and the others back in time.